This section is about what a Master Plan is and isn’t and how it helps shaping the future of a neighbourhood. Want to know at which stage of the Waterloo Master Plan the process is? 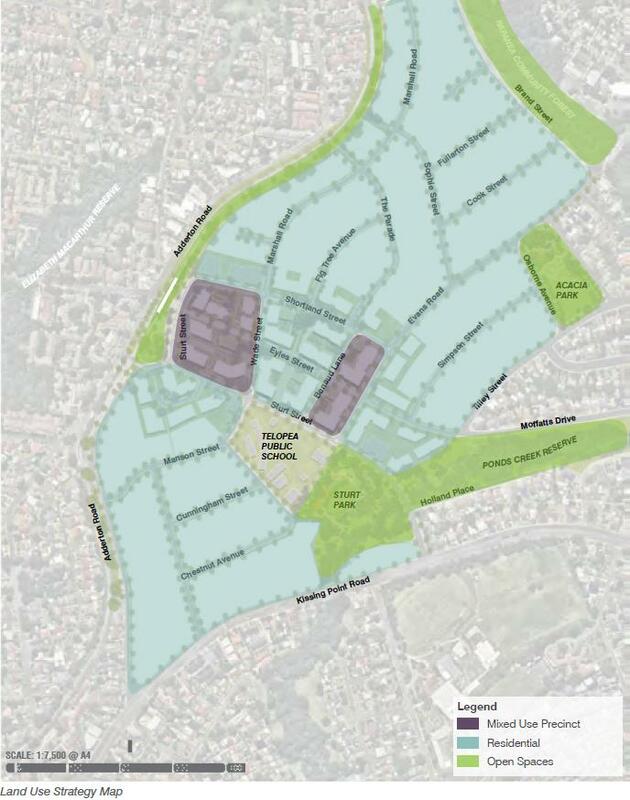 This map selected from the Telopea Master Plan, released in February 2017, shows the strategy to be implemented for land use. A Master Plan contains many maps such as this one to define key steps to implement the overall strategy. Master Planning is a process that aims to create a long term plan or vision for a neighbourhood and a community. The Master Plan is a comprehensive plan that focuses mostly on the build environment. It is not a statutory document and doesn’t have any legal value. However, in the case of Waterloo, the Master Plan will be the basis for changes in the planning controls and production of Development Control Plans (DCP). These changes in zoning and planning control will then assist in delivering the vision and strategy of the Master Plan. It is therefore essential that you have your say about the future of Waterloo during the Master Planning process! The Master Planning process of Waterloo redevelopment includes many opportunities for residents to have their say and influence the outcomes of the redevelopment. Inner Sydney Voice encourages Waterloo Estate tenants and local residents to participate in workshops run by government as part of Waterloo Master Planning and to push for what they believe should be integrated in the Master Plan. The resources below come from the “Master Planning for non-planners” workshop ran by Inner Sydney Voice in May and June 2017.